We have a special menu planned for Valentine’s Day at Roundabout Grill. 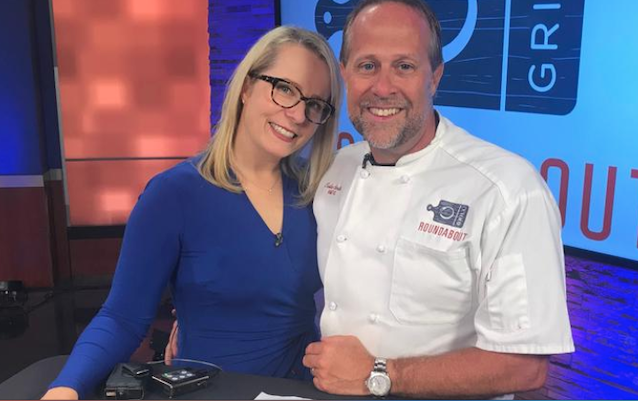 The dish Chef Colin has prepared on Fox 11 Reno is a Chicken Saltimbocca, featured as one of the options on the prix fixe menu for the evening. It is prepared with some fontina, prosciutto and a little basil, that is stuffed inside the chicken breast and roasted. It sits on a bed of Campanelle pasta with prosciutto and sage in a light asiago cream sauce. Other prix fixe options will be prime rib and halibut. The regular menu will also be available that evening. To make reservations and get optimal times, please call today: (775) 398-5454.